Landscape architect Alec Hawley explores a dynamic collection of succulents for his own backyard living wall using the Florafelt Pro Vertical Garden System. Alec experimented with a wide variety of succulent species to identify the most successful for the environment. The succulent garden is the focal point of the yard and provides a backdrop to the children's play area. It's an inspiring place to discover and learn. Landscape architect Alec Hawley explores a dynamic collection of succulents for his own backyard living wall using the Florafelt Vertical Garden System. Landscape designer Brandon Pruett boasts his masterful aging vertical garden works on display at Living Green Design showroom gardens in San Francisco. The entitled 'Birds of Prey' vertical gardens were transferred here after the 2013 Decorators Showcase in Pacific Heights. The Florafelt Pro System infrastructure was reconfigured into a large single living wall. 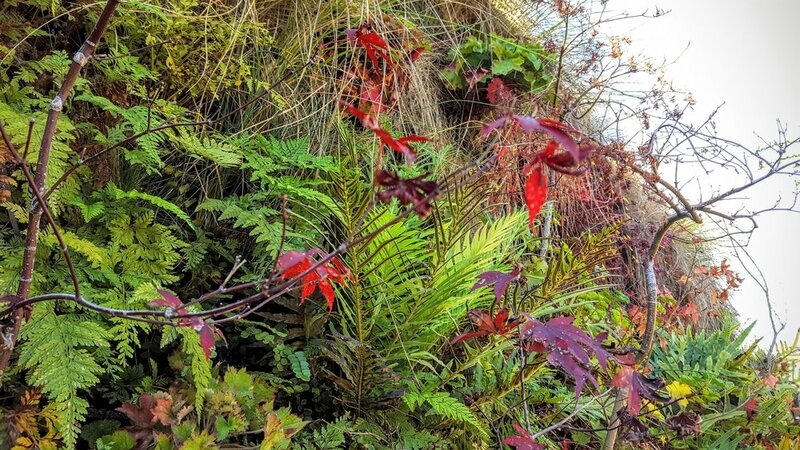 Blue Star Ferns and Leather ferns fill the lower areas that have more moisture while the Japanese Maples go dormant and lose their leaves for winter. 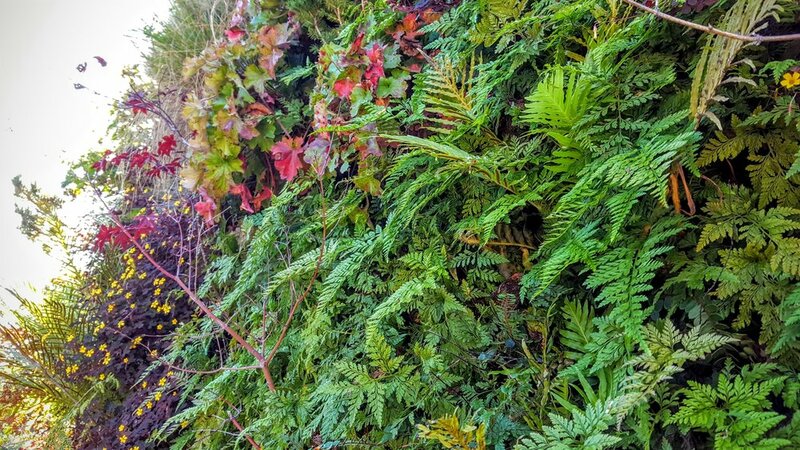 Leather Ferns mingle near the moist lower areas of the living wall. Woody stems of Conifers from the original installation begin to thicken with age. Grasses finish out their season with an undergrowth of dieback.